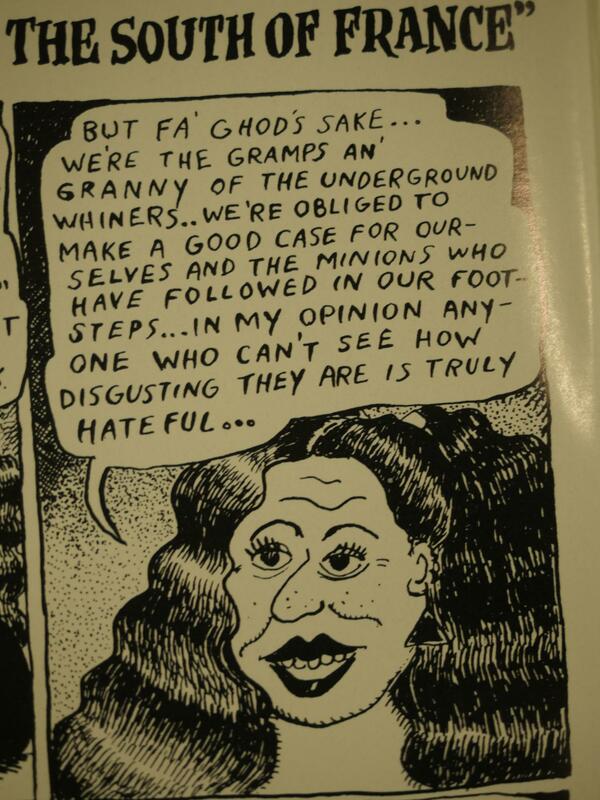 Self-Loathing Comics #1-2 by Aline Kominsky-Crumb and Robert Crumb. 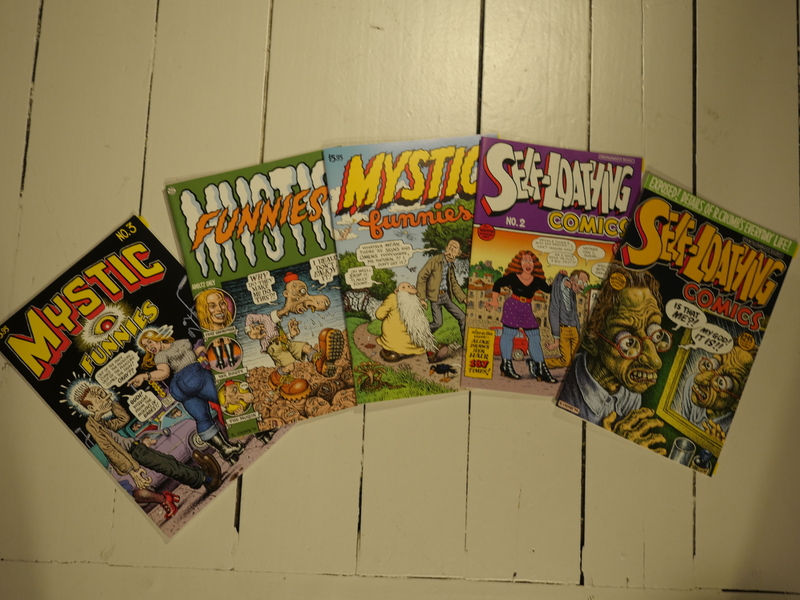 Mystic Funnies #1-3 by Robert Crumb. 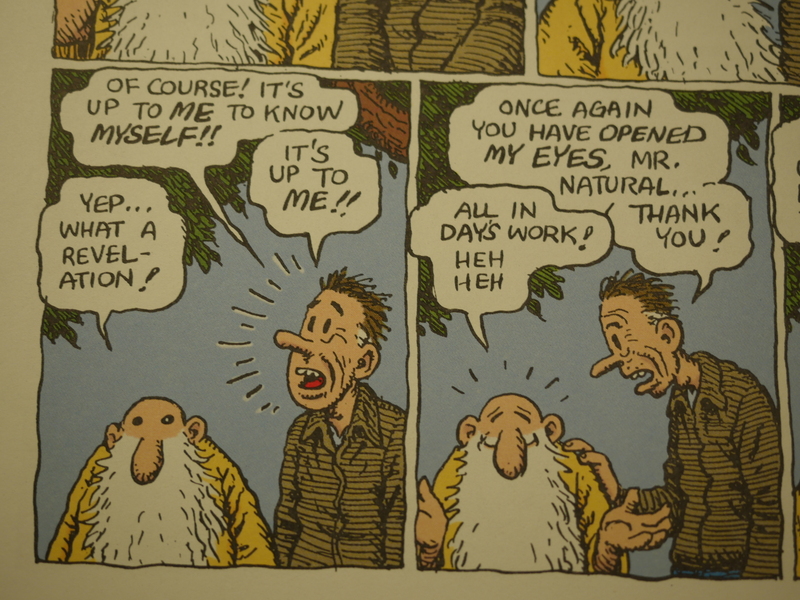 Fantagraphics has published a large number of Crumbian books, most notably the Complete Crumb Collection in the 80s, and the Love That Bunch collection in 1990. But they haven’t really published a lot of their original comics, just various collections. I didn’t even remember that it was Fantagraphics that published these comics: I thought they were from Last Gasp or Kitchen. In the first issue of Self-Loathing Comics, half of the book is by Robert and half is by Aline. They collaborate on the two inside cover strips, but otherwise stay out of each other’s comics. And the concept is apparently to depict a single normal day in their lives from each of their points of view. … and here’s Aline’s. It’s kinda fascinating. 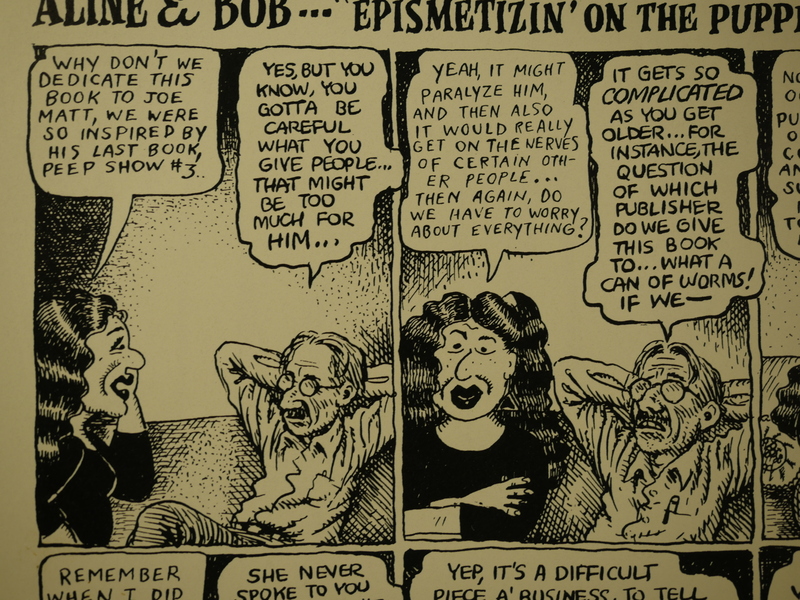 Both Robert and Aline has done autobiographical comics before, of course, but I don’t think anyone of them had taken it to this mundane level before. And I think that perhaps they are trying to out-Joe-Matt Joe Matt a bit. Especially Robert. Here’s the magnificent handover in the centre spread. 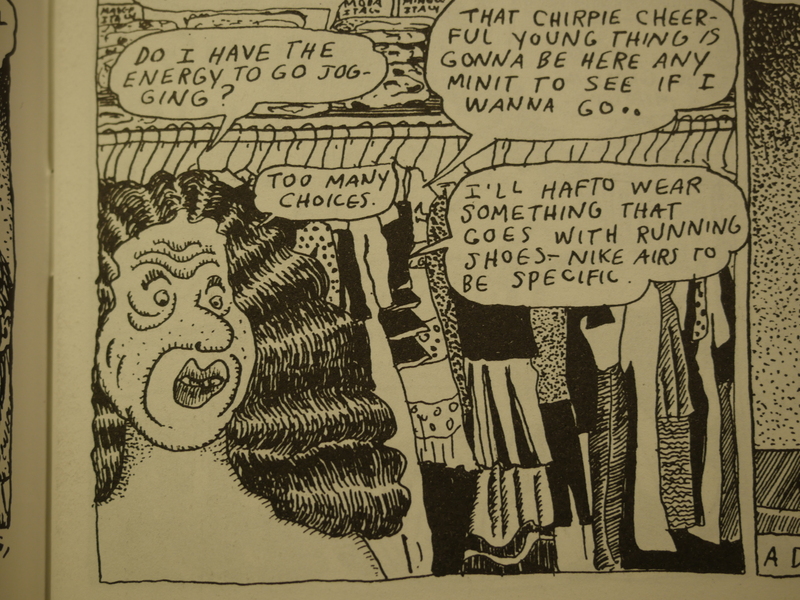 Aline’s half of the issue is perhaps less embarrassingly revealing (in a good/bad sense), and a few pages are taken up with ruminations on clothes. Which I enjoy. Robert draws beautifully as ever, of course, but there’s still something about Aline’s artwork that I feel is just so honest and in your face, and, yes, beautiful in a scratchy way. I love that clothes rack. Robert sums up his thoughts on this experiment. My only problem with this issue is that it’s just too short. They only get to about lunch time, and it feels, pacing wise, that they were aiming for retelling a complete day. While the first issue felt like a serious attempt at doing something new and interesting, the second issue is basically a continuation of their Dirty Laundry series: Instead of each of them doing a separate story, they keep a conversation going by taking turns at writing and drawing, so most panels has text and artwork from both of them. 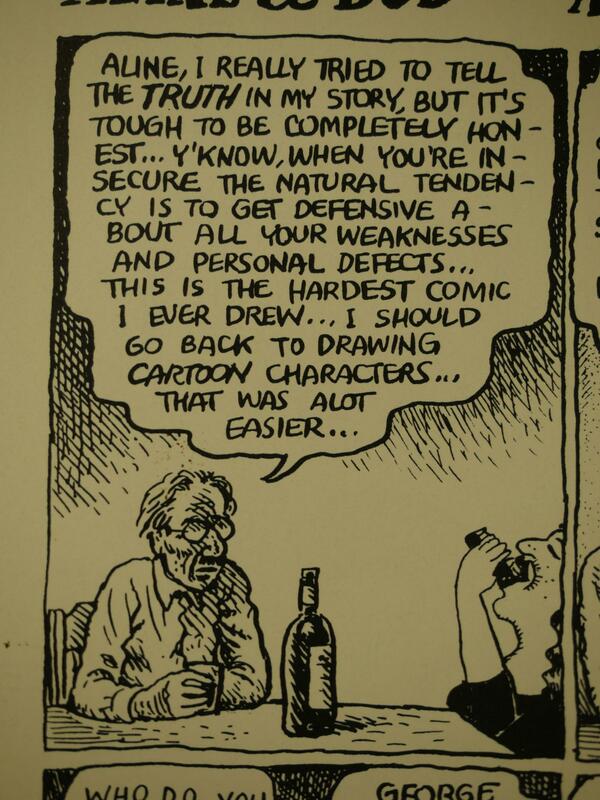 … and Charles Burns and Peter Poplasky here. Burns has a very amusing nervous breakdown brought on by looking at how scritchy the artwork is. So while the second issue is a total goof-off, it’s a funny, pleasant read. I love the way they’re commenting constantly on what’s going on and the drawing, and (as we see here) comments on the comments. 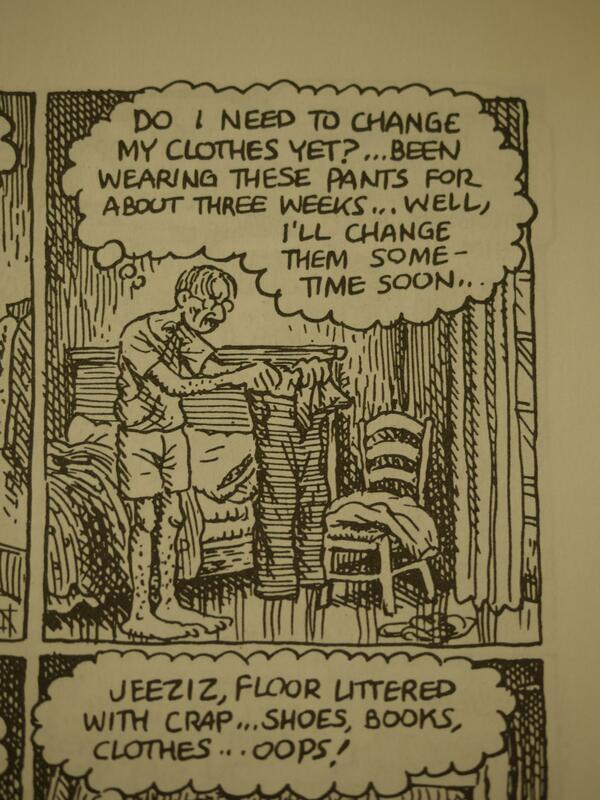 Mystic Funnies was Robert Crumb’s next comic book series, and, I think, his last. 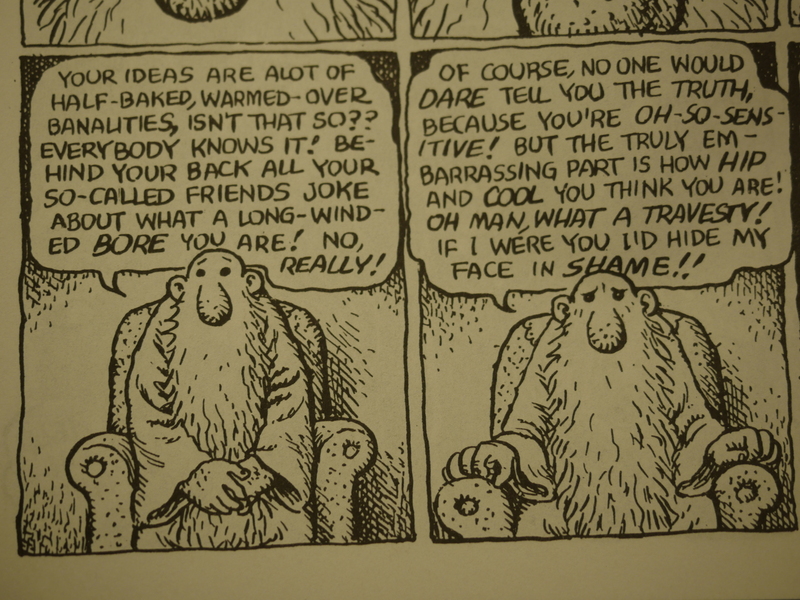 Fantagraphics reprinted the series in full, but originally only the third issue was published by them. 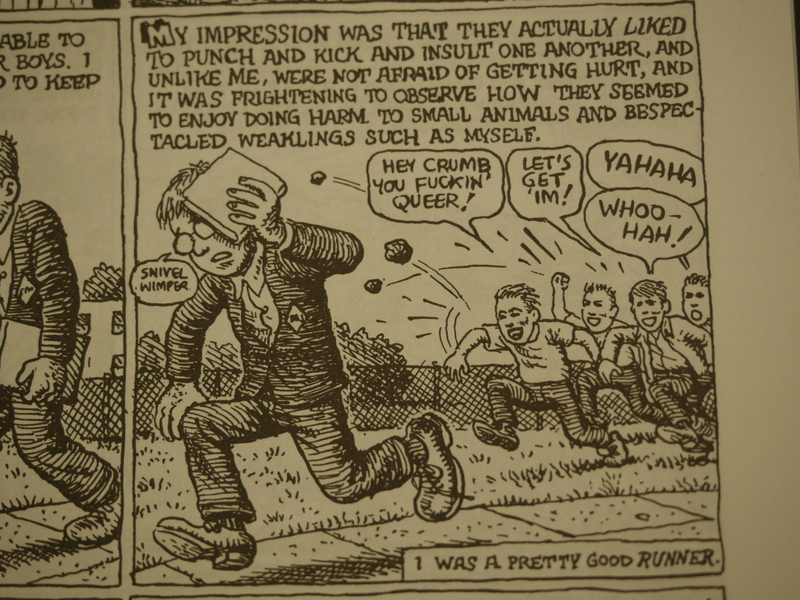 The book features Crumb’s old, old characters Flakey Foont and Mr. Natural, and they’re pretty much as they used to be. 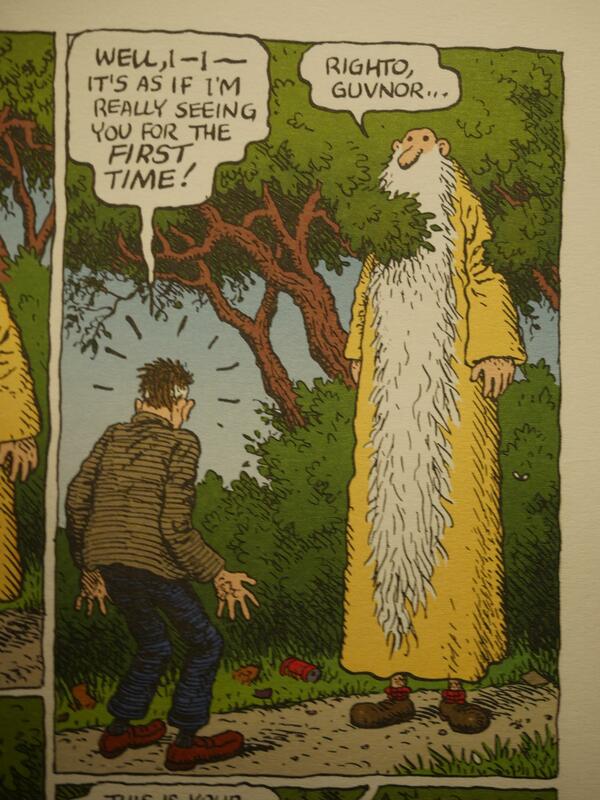 Crumb makes fun of new age mystics and people on the search for “meaning”, but in a sympathetic way, mostly. 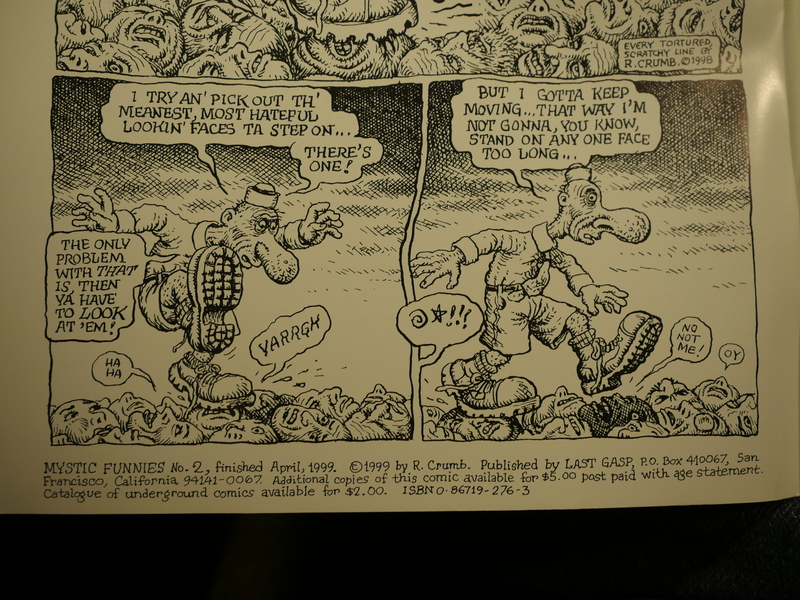 The second issue is from Crumb’s long time publisher Last Gasp, and is in black and white. It continues the philosophical meanderings, but is more pointed this time. 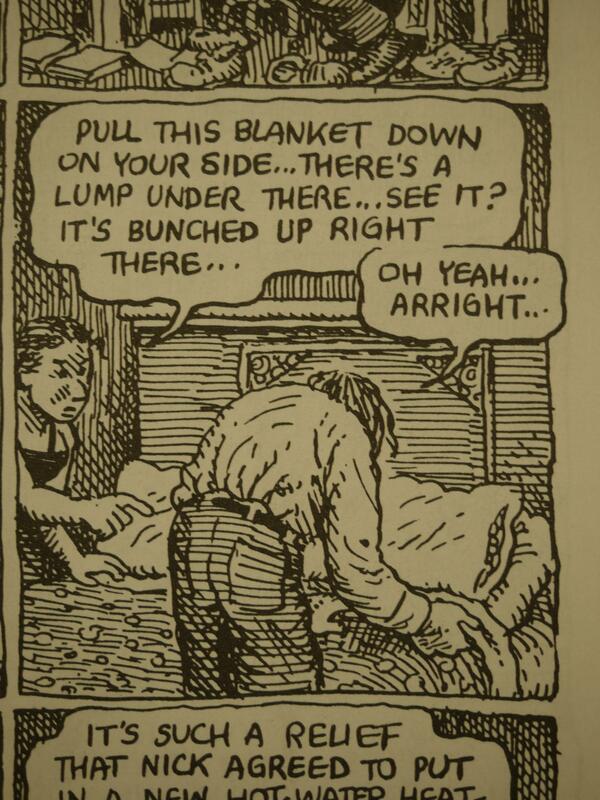 The stories have an improvised feeling, but I guess that’s true of most of Crumb’s work. And finally, the third issue isn’t very mystic at all. Instead of riffing off of the themes from the early 70s that the first two had done, the third issue is more like an issue of the late-80s Hup comic. Which is totally fine be me: I think it’s perhaps the strongest issue of the three. We get one longer weird story, one childhood reminisce, and one Donald Duck parody. Sort of. It’s a solid issue. Most of Aline Kominsky’s work was collected in the Need More Love book about a decade ago, and it’s rather wonderful.